Hard rock and heavy metal are like siblings when it comes to types of music. Layman to the guitar sound may easily confuse both types. For me, the symbol of the blend of these two genres was a now defunct Metal Edge magazine, who had no problems with putting Poison and Motörhead on the covers of its issues. Not to put down any of those bands, but their sound varied in a significant way. 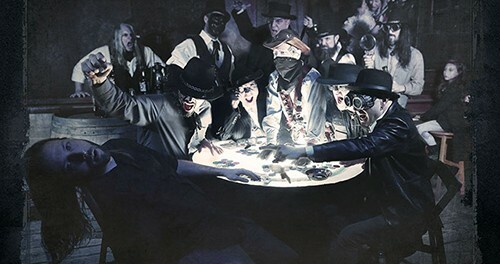 Nonetheless, to a lot of fans out there, hard rock and heavy metal are two types of the same animal, and a lot of bands seem to address their tastes by blending both genres in their music. 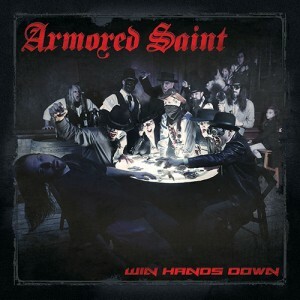 A perfect example of such a very fine mix is the new Armored Saint record Win Hands Down. “The Saint” as they are often called by their fans have a very original story. Unlike a lot of hard rock / heavy metal acts of the ’80s, they did not seem to be destroyed by the grunge onslaught of the early ’90s. They sort of went out on a very high note (no pun to the lead vocalist’s abilities) disbanding all of a sudden after the release of their most successful record to date, the 1991 released Symbol of Salvation. The reason was soon to be known, as the aforementioned powerhouse of a vocalist, John Bush, was announced as the new frontman for the thrash metal legends Anthrax a few months later. The band got together in the early 2000s releasing a rare tracks collection, and a full blown return album in 2010. La Raza as it was called divided their fan base. Some believed this was too weak on punch, with not enough hard and heavy material compared to the releases of their heyday. As more of a hard rock fan than a metal head, I liked the album but even I have to admit it is at least a few notches below from the band’s latest release. Not only is Win Hands Down great on the songwriting level, what really strikes me about this release is that it seems to be very “powerful”. By this, I don’t mean that they are delving into any type of blast-driven death metal genre. I just feel that the energy coming in from these songs could break walls. The opening title track could easily wake the dead. The rhythm oozes energy, and the guitar solo kills. Other tracks such as “Mess”, “Exercise In Debauchery” and “Up Yours” are also like small sonic power plants. Guitar wise, this album is really one of the best I heard this year. The solos are carefully crafted, yet with a real punch. The songs here are not only very powerful, but they also are diverse in a way. When listening to this album, you won’t get the impression that the tracks blend in together. There is not much repetitiveness. The writing is far away from the usual verse-chorus-verse-solo style, as it even tends to wander a bit close to prog. A song such as “Dive” is a good example. There are also some violin used at some point, and some oriental sounds, which can be hit or miss on the rock record, but here evidently, it hits the spot! After what I wrote here, it is pretty obvious that I really enjoyed this record. Again, in regard to being a powerful rock-metal record, which does not cross the line to power metal or grind core territories, this one is as good as it gets. I really enjoy this CD while working out or driving long distances. I even literally got a ticket for speeding while listening to it. It really gives a huge kick of energy, and if you are a rock guitar music fan, whether you prefer Aerosmith or Judas Priest, Motörhead or Poison, Metallica or the Crüe, this album will definitely put a smile on your face. And it will pump you up for the rest of the day.